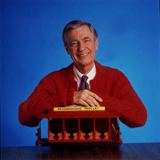 Below is the Mister Rogers' Neighborhood (Arr. Paul Murtha) - Bb Tenor Saxophone sheet music by Mister Rogers. We have 1 arrangement for Mister Rogers' Neighborhood (Arr. Paul Murtha) - Bb Tenor Saxophone Concert Band Sheet Music.